The new high-performance Data Center of telecommunications provider envia TEL in Taucha near Leipzig was officially opened on May 21, 2014. Over an area of approximately 1,000 m², it provides space for around 300 server cabinets belonging to companies, public institutions and local government units. Two STULZ CyberCool 2 chillers operated in parallel, with Free Cooling coils and flexible Mixed mode, ensure reliable and especially efficient air conditioning. envia TEL GmbH belongs to the enviaM Group and is Central Germany's leading regional telecom service provider and network operator. From its base in Markkleeberg and with a workforce of around 120, the company supplies information and telecommunications services to over 5,000 business customers. With its state-of-the-art fiberglass infrastructure that extends to nearly 2,900 miles (4,600 km), envia TEL covers roughly ten percent of Germany and is connected to all the major interregional and international network operators via over 600 network connection points. As well as the new data center in Taucha near Leipzig, the company has further sites in Chemnitz, Kolkwitz and Plauen. By carefully coordinating all the work involved, STULZ and envia TEL have managed to complete the installation of the precision air conditioning system in the new data center in Leipzig in just four months, despite wintry conditions. It was a prerequisite to find a suitable air conditioning concept capable of overcoming the challenges inherent in connection of the building and integration in the building services management system. Preserving the leakproof nature of the building, in particular, was vital in order to ensure the correct function of the integrated oxygen reduction system for fire prevention. And of course, envia TEL's technical requirements and demands in terms of performance played a significant role in the planning and implementation of the air conditioning system. Outstanding energy efficiency was a primary objective. Furthermore, the solution had to demonstrate important characteristics such as high availability through redundancy, modular flexibility for differing performance requirements, and scalability for the planned second expansion stage. To satisfy these requirements, for the construction of the Leipzig data center STULZ and envia TEL decided to employ two STULZ CyberCool 2 chillers each with a nominal capacity of 800 kW. These highly efficient systems with Free Cooling coils have been optimized especially for the air conditioning of server environments. Both chillers supply a joint refrigeration pipe, and this redundancy ensures high availability of the air conditioning. At the same time, parallel operation permits energy-saving low load operation, with all connected components running at reduced speeds. The pipeline system in the data center was designed as a circumferential loop with supply and return distributor rings. This way, sections of the pipeline can be shut off or extended at any time, without interrupting ongoing operation. Further connections are already in place for additional air conditioning cabinets and chillers, preventing leakage from the building during future building work. In addition, thanks to its state-of-the-art open and closed-loop control technology, the air conditioning system could be fully integrated in the building services management system. A speed-controlled screw compressor and a Free Cooling coil both produce chilled water for the two CyberCool 2 systems. As long as the outside temperature does not exceed 5° Celsius, cooling takes place using solely the energy-saving Free Cooling function. At higher temperatures, the compressor is activated in increasing stages. Thanks to this flexible mixture of Free and compressor cooling, energy-intensive compressor running times can be greatly minimized. Load-controlled screw compressors, pumps and EC fans in the condensers and air conditioning cabinets also help to reduce electricity consumption. Due to its compatibility with all common BMS protocols and through the use of individualized software specifically for this project, the intelligent control system of the STULZ CyberCool 2 systems ensures easy integration in the building automation system. Moreover, it coordinates the parallel operation of the two chillers, and by regulating the speeds of all the components used - such as pumps and EC fans - it enables especially energy-saving operation. This way, in coordination with an encapsulated compressor chamber and with the aid of specially developed fan diffuser attachments on the refrigeration condensers, the control system reduces the running noise produced by the air conditioning solution as a whole. 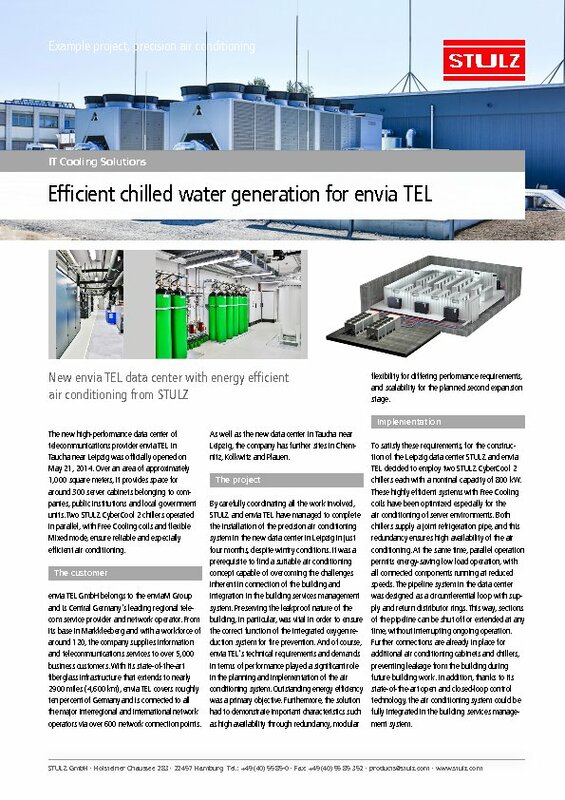 Thanks to Free Cooling and flexible Mixed mode, the CyberCool 2 chillers in use here make a major contribution to the exceptionally efficient operation of the new envia TEL data center in Taucha near Leipzig. The expert planning and implementation of the air conditioning concept have already resolved the challenges of the future. The integration of the pipelines in the building while preserving the integrity of the fire safety system and the connection of redundant precision air conditioning units to the building services management system guarantee maximum safety. In addition, existing, ready prepared connections for future air conditioning components ensure scalability and ideal flexibility for reacting to changing performance requirements. Simultaneously, these measures ready the data center for the planned second stage of expansion.